An industrial railway is a type of private railway used exclusively to serve a particular industrial site, either entirely within a mine or factory compound, or connecting the site to public freight network. Industrial railways were once very common, but with the rise of road transport, their numbers have greatly diminished. 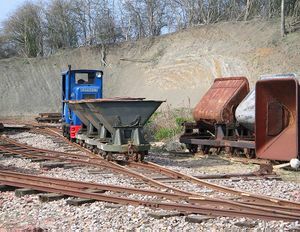 As an example, an industrial railway would transport clay from a quarry to an interchange point with a main line railway, where it would be transported to its final destination. The line would be owned and operated by the quarry company, and would exist solely to serve the quarry. Most industrial railways are short, usually being only a few kilometres long, but there are notable exceptions - examples of which include the iron ore-carrying railways in Western Australia which are hundreds of kilometres in length and exist to transport iron ore from the inland to the coast. Industrial railways serve many different industries. In Cuba a large number of industrial railways serve the sugarcane industry. In Colorado, the Coors Brewing Company uses its own industrial railway to shuttle rolling stock around the brewery both for the delivery of raw materials and for shipping finished product. Some industrial railways serve ammunition dumps. This page was last edited on 3 January 2012, at 20:40.